When creating a logo, one of the key things to consider is the balance. In fact, like in life, maintaining a good balance amongst different design elements is important. A logo design that perfectly keeps a balance of colours, typeface, shape, and so forth will help evoke the trust, confidence, and other emotions from viewers. Logos are important business symbols. People first see a logo on a product or service before buying it. 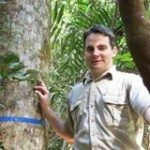 It can assure a buyer about the authenticity and genuineness of a product. It fills buyers with confidence. But that is just a primary purpose of a logo. In the modern competitive world of business, logos have many other roles to play. These symbols engage potential customers. They convey a certain business message to target customers and help build a brand identity of a company. However, to create a perfectly designed logo, one of the key things to ensure is the balance. We all love to lead a balanced life, which covers all aspects of living a life happily. Similarly, all the design elements must present themselves in a balanced way.Only such designs will appeal our senses. One of the mistakes most inexperienced designers make is that they place the elements randomly in a logo as per their choice. They are less aware of the balancing techniques. They usually do not pay attention to keeping different elements in proportion.So,the material that is created without taking into account balance looks odd to the eye and leaves a bad impression. Therefore, the professional designers take help of online graphic designs grids to create a logo or graphic design.A grid helps in outlining and smoothening the edges or corners of a logo design. When you create a grid, it ensures that all the lines maintain a nice smooth flow through the design. Another technique that designers use for balance is creating a logo in vector format.This format helps in scaling up a logo to any greater size and still keeps its sense of proportion. So, if such design is displayed in a big size as part of a billboard design, it retains its quality and size. It is to be noted that when an image is made of pixels, it tends to become blurred if its size is altered. But there is no fear of the elements getting imbalanced in size when created in vector file. Therefore, your logo design must have all the elements in right proportion.A graphic designer follows many graphic design services principles such as unity, emphasis, contrast, etc. The aim here is to create materials such as a brochure,business cards,websites, etc that have a purpose and please the eyes. In fact,the success of a logo in drawing the attention of people is in balancing different design elements.This is because our brains process a simple and well-balanced design quickly. What Is Balance In Graphic Design? What do you mean when you talk of balance in a logo design? Well, everything that we see in a design has its own visual weight. For example, colours and fonts are two different elements having their own usefulness. But the problem of balance arises when one element dominates the others heavily in a graphic design, creating an unbalance. For example, your logo design has two colors – dark and light. In that case, dark color will naturally look heavy to the eyes. Because of this, dark color will weigh heavily on the lighter color. That is not desirable as people may not like the bias toward one color. You can compare this with a leaning building, which makes people fearful. They have concerns of their own regarding such a building. Similar is the case with logos that have some element overwhelming the other elements. We, humans, want to see some balance everywhere as we like to see the stability. Moreover, the balance is essential to help fix viewer’s eye on a logo design. If there is an imbalance, focusing on the design as a whole becomes difficult, and conveying a message will become even more difficult. Balancing is all about distributing the elements in a design to maintain a nice visual appeal. But that does not mean that the designer should essentially distribute every element symmetrically. Know that the balance can also be achieved in an asymmetrical design. So, we can say that balance is about knowing and adjusting a visual appeal of different design elements such as color, typeface, scale, contrast, etc. In symmetrically balanced logo ideas & inspiration, every element carries a visual weight, which is distributed evenly. So, every element appears to be in harmony with the other elements, either horizontally or vertically. If you draw a straight line through the middle of such designs, you can then notice that both the halves of the design have a balanced distribution of the elements. Such a symmetrical composition appears orderly and stable. 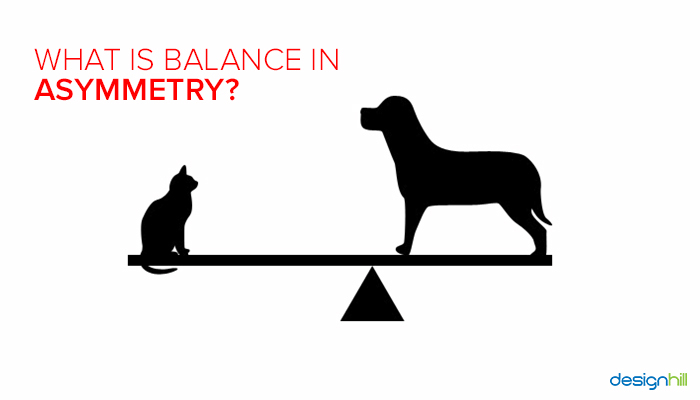 What Is Balance In Asymmetry? As it has been mentioned, even an asymmetrical design can appear to be balanced. In this case, the designer deliberately creates the imbalance to create a memorable design and to send a specific brand message. Here, the design elements are knowingly distributed unevenly for a purpose and one side can appear heavier than the other. To achieve balance, the designer adopts some tricks. All the smaller elements can be placed on one side. Then, to balance them out, a large element can be put on the other side. Another trick is that the smaller elements are placed too away from the centre of the design composition. These elements will thus appear further away from the larger element, keeping the visual balance. 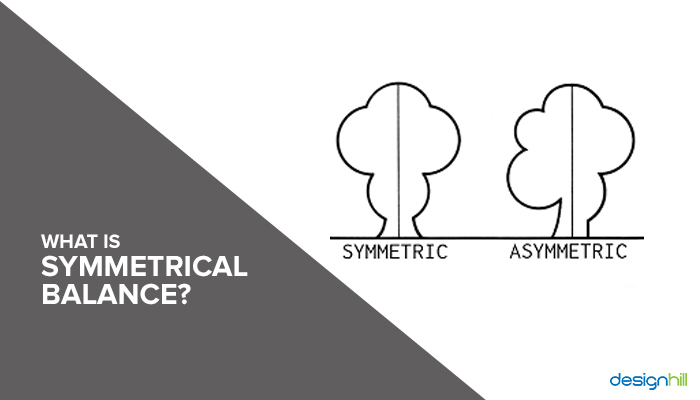 Unlike symmetrical design, the elements in an asymmetrical design are not of the same size. They are also not positioned evenly. Still, our eyes get some sense of visual balance due to tricky arrangements of the elements. 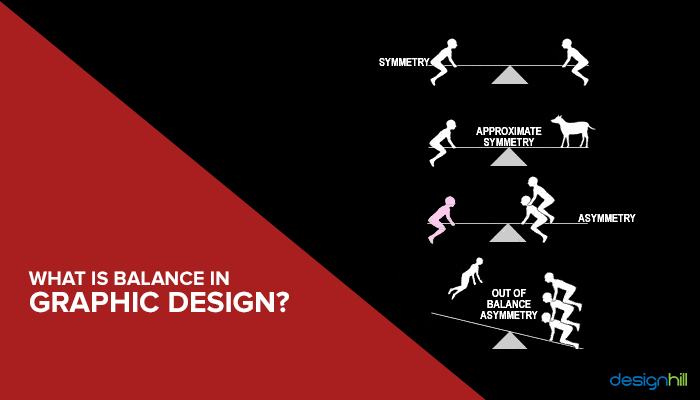 Balancing asymmetry is, in fact, one of the first condition to create most designs including website design, which is so crucial to doing business today. 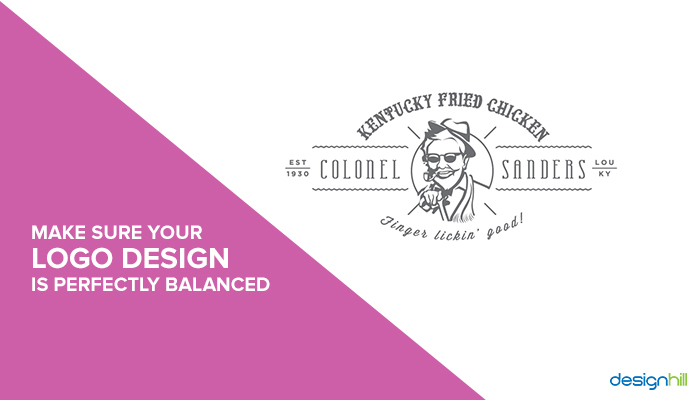 How To Achieve Balance In Your Logo Designs? You can achieve balance in your graphic design services including logo design in a number of ways. For example, if it has some small areas with vibrant colors then balance it out with neutral colors in the larger areas. Similarly, you can think of making a good use of a variety of shapes to balance them out in a design. You can also pay attention to the position of the elements to achieve balance. Color balance – Make sure that there is a perfectly symmetrical or asymmetrical balance of colour. You can get it by having bright colors in a small area and balancing that out with a larger dark colour area. Shape balance- You can achieve the balance of shape by putting all the complex details on the one side and rest of the details in the plain area on another side. Position balance – Make sure that you regulate the position of the elements in your logo design. So, if there is a large object on the one side of the design, balance it by having some smaller objects on the other side. For example, the Zu coffee’s website design uses some smaller and large elements. On the top left of the site, there is Zu logo, which is balanced by designing a smaller Zu coffee packaging on the lower side of the right section. Texture balance – Also pay attention to the texture. Some areas of complex details in your logo design will attract the attention of viewers. But you should balance it out by creating a large area of the flat elements on the other side. So, create a larger area with no texture to make the smaller area with heavy texture attractive. Eye direction balance – Like in other graphic designs such as brochure design, your logo design should also follow the rules of eye direction. You achieve this balance when your logo successfully draws the viewers’ eyes to the main element of the design. In a logo, however, due to smaller shape, this balancing element is not so significant, but it should be kept in mind when designing. So, these are the key aspects of a well-balanced design. If you want to have one such logo for your startup, you can crowdsource to Designhill. This site is a leading platform where hundreds of professional graphic designers look for design contests from business owners. Launch your logo design contest to see dozens of designers working to win your contest. You get new design ideas with balanced elements. Your design cost will be entirely affordable. Balancing of different elements in a logo design is important to make it look appealing, unique, and memorable. Use grid system to maintain the right proportion of lines and shape for better scalability. Also, the balance of colours and fonts is equally important. The design should achieve both symmetrical and asymmetrical balance.